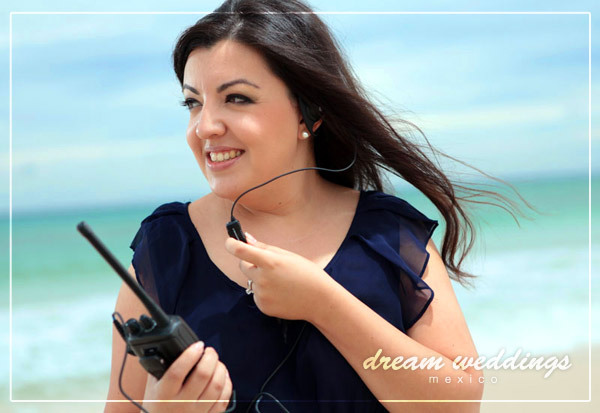 is the Founder of Dream Weddings Mexico, a full-service beach wedding planning company. Since 2004, she has combined her experience and passion for detail to produce hundreds of extraordinary Weddings across the most stunning beaches in Mexico. Whether an elaborate or a small intimate wedding; she can turn your dreams into a reality. I always think I don’t have a job…I have a passion. There is nothing that I enjoy more than producing the most beautiful weddings for my clients. My inspiration comes from them. Every client is different and our events are planning based in their vision and my experience. I also love golf, food, wine and travel. Details! Every single detail is just as important as the wedding. I always analyze and organize every element of your day to insure great results. From the site inspection to find the perfect venue to the thank you note, I will make sure that all of your details are carried out! I look forward to assist you making your dreams come true. Is the co-founder of Dream Weddings Mexico, she holds a Bachelor of communication sciences and specializes in Organizational Development. She is also certified in floral design by the Mexican Floral Institute. Definitely flowers and stationary¡¡. Talk to the couples for the first time! listening to their dreams to then bring them to reality. Endowed with incredible creativity, meticulous attention to detail has an exceptional ability to transform clients visions into reality and capture the essence of the couple to turn it into a unique celebration. Details! Every single detail is just as important as the wedding. I always analyze and organize every element of your day to insure great results. Swimming, baking and gardening are my biggest hobbies, besides being faithful passionate baseball, football and boxing.